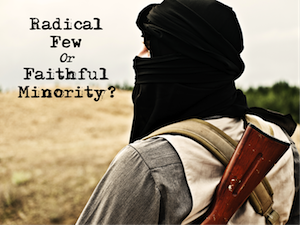 Radical Few or Faithful Minority? 1. Does the majority represent what Islam is intended to become? 2. What will happen when the majority decides to return to the teachings of their holy book? Over the next few weeks, I plan to expose three areas of Islamic instruction that are too often overlooked, Barbaric Violence, Abused Women, and Life-sucking Legalism. To do this, I will go directly to the Qur'an. I will quote from the very instructions Muhammad himself supposedly received from Allah. It is the purpose of this study to lead us to one very sobering question - What will we do if the second largest world religion rallies its members to return to faithful obedience of the teachings and practices laid out in the Qur'an? I believe it is only a matter of time. Are you spiritually strong enough to persevere under the persecution already being felt by thousands of Christians worldwide? On Tuesday, January 22, 2008, I completed the long arduous journey of reading Islam's most holy book - the Qur'an. From this experience, I concluded that most Christians, and even Muslims, have little understanding of what the Qur'an actually says. The world needs to understand why this backward religion has had so much trouble emerging from the dark ages. The liberal world of unconditional tolerance would have us to believe that all religions are rooted in belief of the same God; "Many roads leading to the same place". In truth, however, the God of the Bible "is a jealous God". (Exodus 34:14, NIV) He does not honor those who dishonor His supremacy. Allah is not Jehovah. (Request our Q&A Card entitled, "Is Allah Jehovah") Failing to confront this false doctrine is nothing less than a dereliction of duty and an insult to God. “You shall have no other gods before me … You shall not bow down to them or worship them." The Islamic religion is nothing less than anti-Christ in its pursuits. It denies that Jesus is Divine and followers view Him as a subservient underling of Muhammad. Those who resist these anti-Christ doctrines are given three options: convert, be enslaved, or die. Are you and your children spiritually strong enough to persevere under those conditions? Failing to prepare for these dark days is nothing less than a dereliction of duty and an insult to God. "You will be hated by everyone because of me, but the one who stands firm to the end will be saved … Do not be afraid of those who kill the body but cannot kill the soul. Rather, be afraid of the One who can destroy both soul and body in hell." Offering assistance requires that we first understand the problem. It must be remembered that the Qur'anic passages you are about to encounter are just as treasured and authoritative to Muslims as the Bible passages we cite to establish our own system of values. To help our Muslim friends find Jesus, we must first understand what is standing in their way. We must engage them in legitimate discussions about their holy book. Failing to expose this false teaching is nothing less than a dereliction of duty and an insult to God. Lord willing, next week we will look at the very timely topic of barbaric violence promoted within the Qur'an. I hope that you will join me in this study and you will pray for the "Make It Real!" Ministry. Back to Top of "Radical Few or Faithful Minority?"